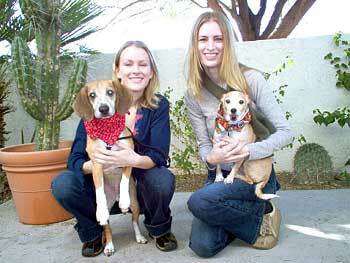 Downey is the beagle on the left and Baldwin (B&B alumni) on the right - their moms are sisters! It's a family affair as three generations have adopted dogs from us!!! Downey came from an unscrupulous Beagle breeder and was about to be sold to medical research (we think) at five weeks. Cyndi brought him home sick and weak. Baldwin, of course, came from B&B. He is so precious! What a great doggie Baldwin is... when Kelli brought him home, he was so shy. And now, the happiest dog I've ever seen, simply spoiled rotten!